At the conclusion of a family law case, courts and judges are going to assume that the parties are going to abide by their orders and judgments. In the family law context, this can involve orders on all kinds of things, including property and debt division, child custody, child support and other related areas. When a party fails to abide by an order, the general remedy is for a party to file a motion for contempt. A motion for contempt can be filed when a party fails to abide by a court order or judgment willfully and contumaciously. If a party is found in contempt of court, the judge can order various remedies. First, the judge can often order the party to comply with the court’s order and judgment immediately. In addition to this, a judge can often order a party to pay attorneys’ fees or a fine. A party can also be incarcerated until such time as they comply. As it relates to back child support and spousal support in particular, a court may order a party pay a certain amount to purge themselves of the contempt. In many circumstances, a party can be released from jail upon that payment. Or they might be able to avoid jail in the first place. In certain circumstances, a party may be able to argue that they are unable to comply with the court’s order and judgment. If a party is unable to comply, they are generally prohibited from being found in contempt because they willful element is negated. This defense to a motion for contempt is generally a high burden. A party truly has to be unable to comply with a court’s order to avoid being held in contempt. If a party raises this defense in bad faith, it generally shouldn’t work and it could put themselves in a worse for position if they are doing things like concealing assets and money that they could use to pay child support, spousal support, etc. Nonetheless, the inability to comply is a defense that can be legitimately raised in some circumstances. 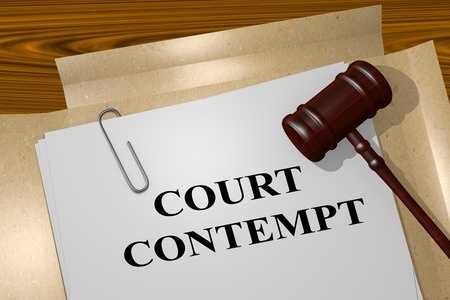 If you are going through contempt proceedings, Stange Law Firm, PC can help. You can contact us at 1-855-805-0595.